Registration is required--this is not a drop in class and space is limited. Bone Builders is a twice-weekly one-hour class for seniors 55+ sponsored by the Montgomery County Department of Health & Human Services and the Kensington Park Library. This free, enjoyable, evidence-based bone-building and fall prevention program is designed to improve muscle strength, bone density and balance over time with continued commitment. 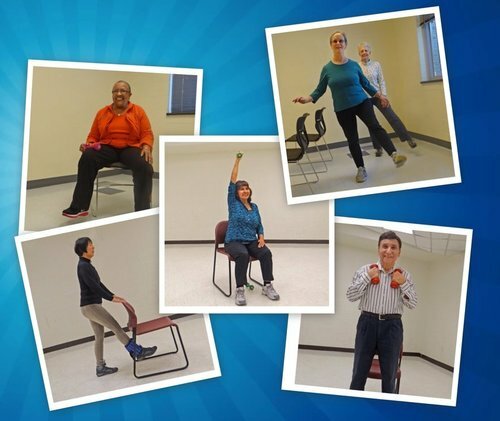 Participants must attend BOTH the Monday and Wednesday classes, be able to exercise sitting and standing, and be able to walk safely without canes, walkers or wheelchairs. Registration is limited to 18 participants. Participants must purchase their own weighted leg cuffs and hand-weights—requirements & purchase information will be provided at the first class. Participants should bring a water bottle to each class, wear supportive shoes with covered toes and heels, and dress for exercise. Arrive 10 minutes before class to set up. TO REGISTER, please contact Karen Kim at KAZ.YONGJ@GMAIL.COM or 240.401.8476. A waiting list will be maintained and attendance policy enforced if the class is full.